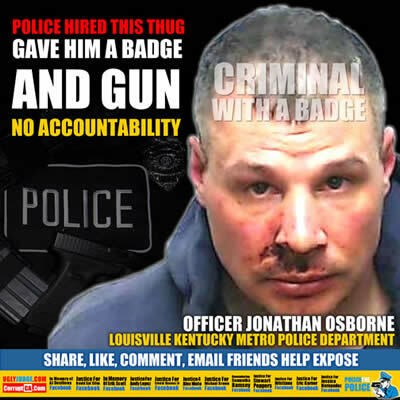 Officer Jonathan Osborne has been exposed for the thug and monster he is. Someone who beats women and breaks the law. Criminals like this are hired all the time by Police Departments all over America. Just because someone has never been caught before or had a record does not mean their fit to carry a gun or badge. Yet their hired, people with mental issues, ego problems and insecurity traits which make them not desirable to be an authority figure. Out on the street, unsupervised these monsters abuse, attack and harm the public without accountability. Worse, our courts, police management and government go out of their way to protect and stop them from being prosecuted. You the tax payer are forced to pay them huge salaries and benefits. Then when they break the law they’re held unaccountable and your tax dollars are used to pay huge settlements to victims and their legal costs. No matter how you look at officer Jonathan Osborne it’s a lose, lose situation which costs hundreds of thousands of dollars. Not to forget the countless lives, crimes and victims whose reports are ignored because they often trust the word of a criminal when he wears a uniform. The text of the stories below tell a story of a criminal who Police hired and gave a gun. He beat his wife and was stopped not by fellow officers but by the public. Police get involved and try and stop evidence from being made public (graphic video not released). What kind of person beats his wife and kicks her in the face like a football? What kind of people are hired as police officers, we give them guns, badges and fail to hold them accountable.